Healthcare organizations across the U.S. are undergoing transformative change in the movement toward healthcare reform solutions that achieve reduced costs, better outcomes and improved patient experience. One of the major shifts is a push toward Population Health, a strategy of care coordination so care partners and services collaborate to best serve the patient and family. Children's Hospital and Health System is an independent health care system dedicated solely to the health and well-being of children. It is one example of a system that focused on achieving this goal, and used a culture change initiative to enable its strategy to be fully successful. 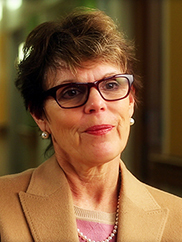 In Senn Delaney’s new view from the top video episode, CEO Peggy Troy discusses creating the ‘At Our Best’ culture to align and engage all areas of the health care system. The shift from a functional business model of services within 13 different divisions to an integrated delivery model was aimed at realizing the purpose of having the healthiest kids in the nation. The latest video featuring Children’s Hospital of Wisconsin is part of Senn Delaney’s CEO thought leadership video series on leading culture change.Other CEO view from the top videos can be viewed at SDTV, a video forum for sharing engaging case studies and best practices of interest to CEOs, executives and senior business leaders on why organizational culture is a key driver of business performance.